Do We Really Need a Toad? To tow or not, that’s the BIG question! 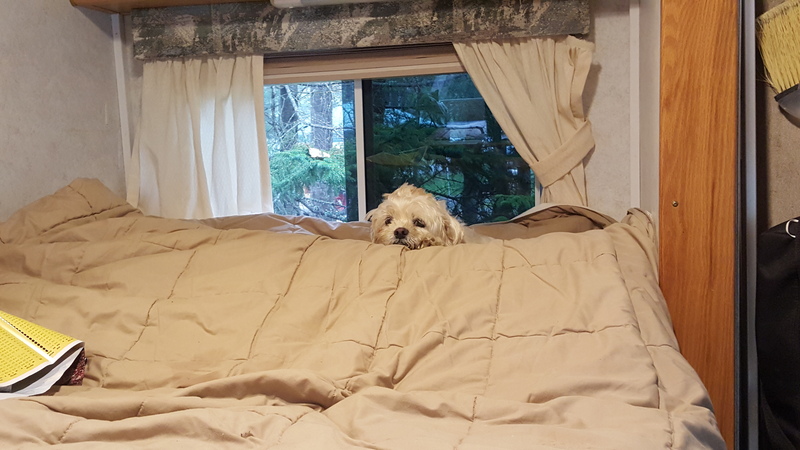 We have had a motor home for the last few years and have gone on several trips. Most of our camping trips have been for long weekends, but a few have been from two to four weeks. We have always managed fine without having a tow vehicle. Even on the longer trips, it didn’t seem like an inconvenience. We liked having everything with us; if we wanted our binoculars to take in a spectacular view, we didn’t have to remember to bring them. If we were hungry or thirsty, or needed a change of clothes, everything was right there. We really like the convenience of that. Probably the most important reason to just having the motor home is because of Heidi. When we do go on side trips, it is often for several hours. We just don’t feel comfortable leaving her for hours at a time when were in a place that we are not too familiar with. If we had a car and brought her with us on a side trip, we would worry about leaving her in a warm car. In a motor home we can keep her more comfortable with the fantastic fan or air conditioner using the generator if necessary. 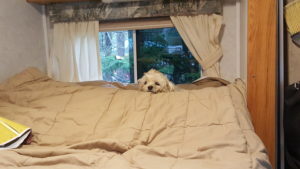 There is less space in the car where she can rest, where as in the motor home she has several places she can hang out! Earlier in the year we needed to buy a new car and so we chose one that was towable, 4 wheels down. We bought a 2016 Ford Focus Sedan. So it was always a consideration that one day we might want to take a toad with us. Is having a toad worth the expense, wear & tear and reduced gas mileage? 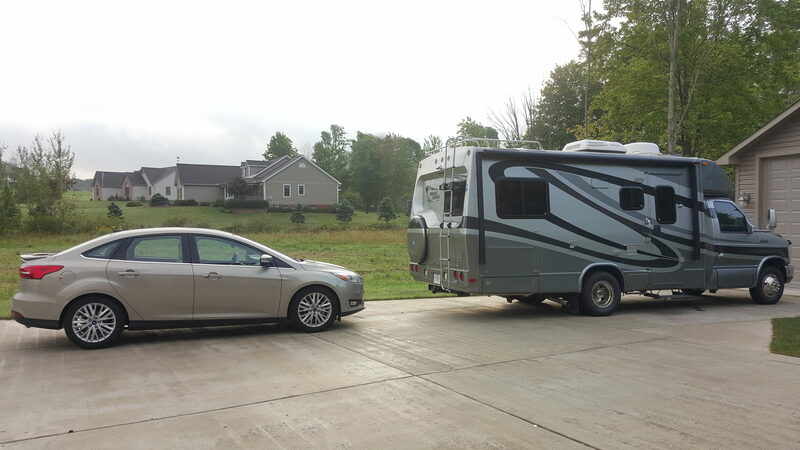 With all the planning we have been doing for this trip, we have gone back and forth trying to determine if we should get the motor home set up to tow. This would involve buying a towing system and taking it to an authorized dealer for installation. Linda called and talked with a couple of sales reps and got an estimate. It is a considerable expense. Other concerns are what kind of wear and tear towing will have on the car. We have never had a tow vehicle before and wonder if the installation of the towing components on the car will make it will look unsightly. It’s a new car and we don’t want to mar it if we’re not going to be towing very often. And of course, there’s the gas mileage. We know that towing will reduce the gas mileage. We’ll be in the southwest for 2-3 months exploring the area. We are anticipating moving around quite a bit from location to location, so we’re not sure if we will need a car. The option to rent a car for a few days could also be a solution. None of the reasons I mention above are deal breakers, if we decide we really want to tow. The bottom line is that we are just not sure if it is necessary, or if we even want it. After considerable thought, we decided not to go ahead with the installation for this trip. Maybe we’ll regret it or maybe we’ll make out just fine. Only time will tell. This entry was posted in Getting Started and tagged Heidi, Toad, Tow. Bookmark the permalink. 2 Responses to Do We Really Need a Toad? Hi Gordon! Thanks for the response. As we said in the blog it was a difficult decision because we think a car would be real handy at the Quartzsite RV show. We don’t think we would use a car too much for the rest of the trip. Like you said, we’ll know for sure after the trip.